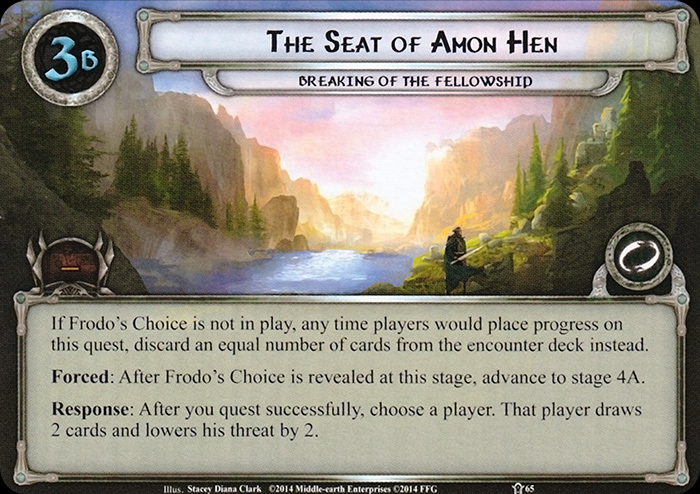 If Frodo's Choice is discarded, reveal it instead. 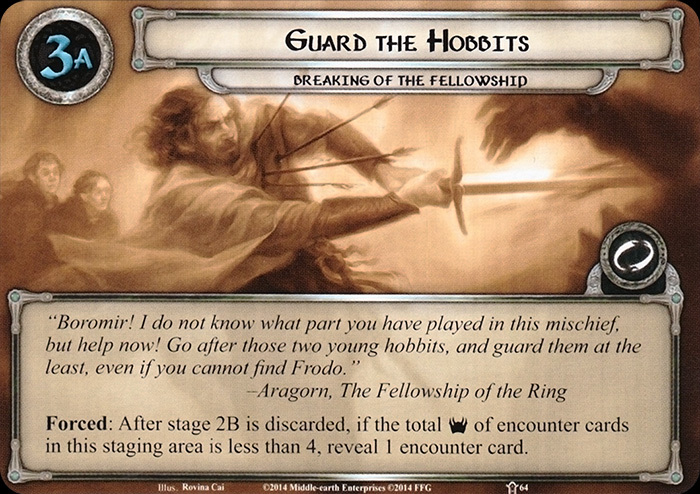 When Revealed: Take control of the first player token and the Ring-bearer (and each card attached to it). Attach to the Ring-bearer. 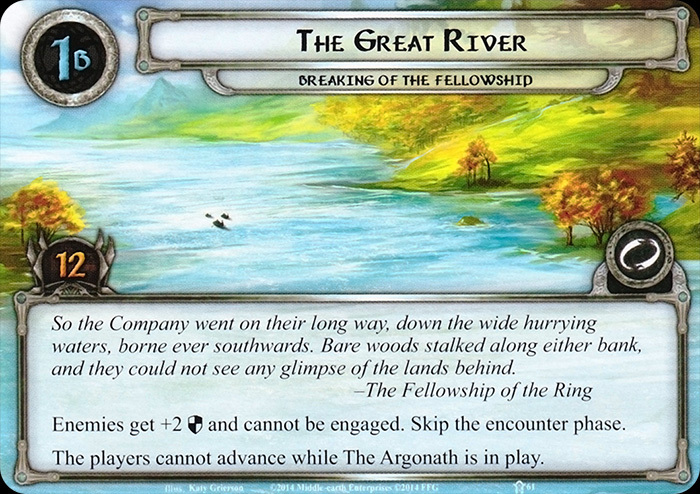 For the rest of the game, you cannot lose control of the first player token. Forced: After stage 2B is discarded, if the total Threat of the encounter cards in this staging area is less than 4, reveal 1 encounter card. 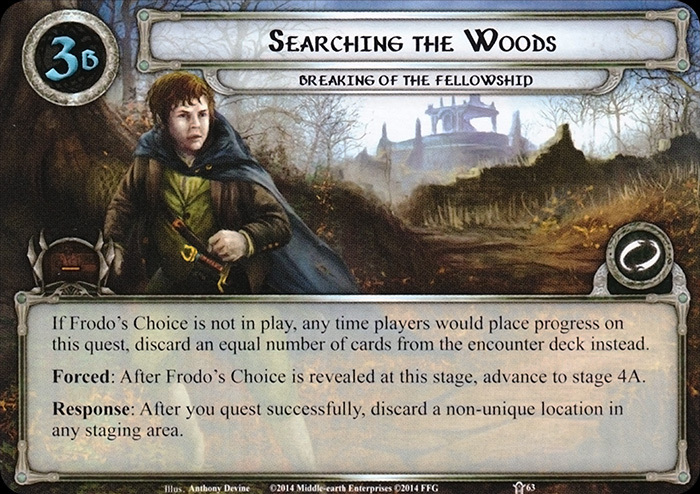 If Frodo's Choice is not in play, any time players would place progress on this quest, discard an equal number of cards from the encounter deck instead. 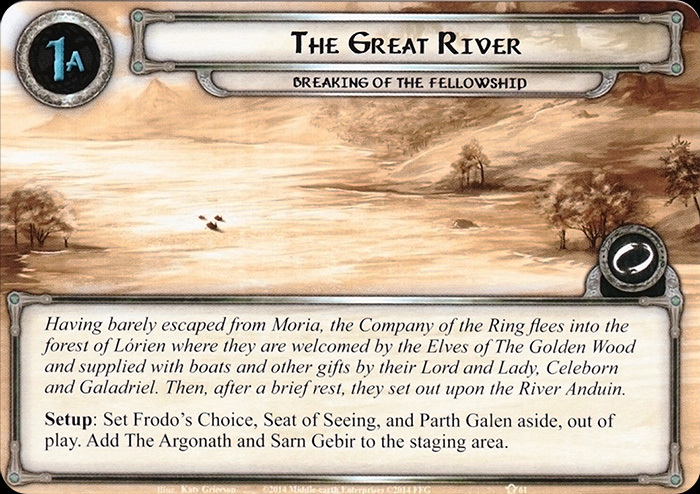 Forced: After Frodo's Choice is revealed at this stage, advance to stage 4A. Response: After you quest successfully, discard a non-unique location in the staging area. Forced: After stage 2B is discarded, if the total Threat of encounter cards in this staging area is less than 4, reveal 1 encounter card. 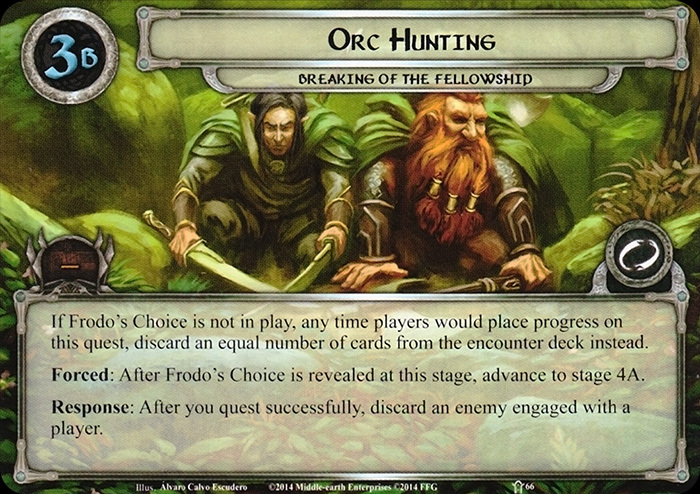 If Frodo's Choice is not in play, any time players would place progress on this quest, discard an equal number of cards from the encounter deck instead. 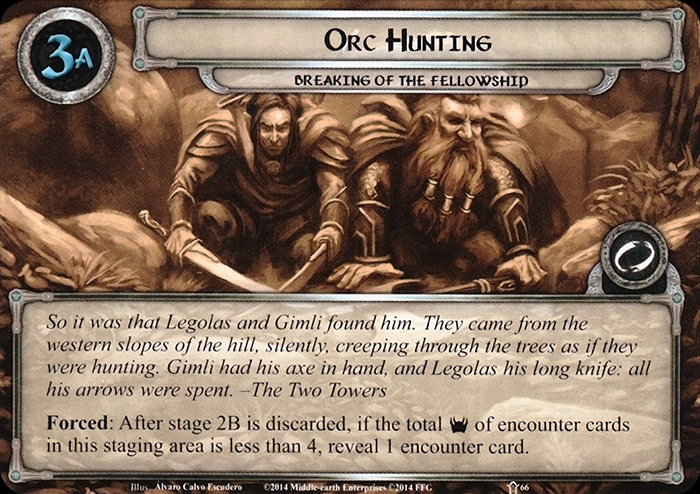 Forced: After Frodo's Choice is revealed at this stage, advance to stage 4A. Response: After you quest successfully, choose a player. Ready each of that player's heroes. 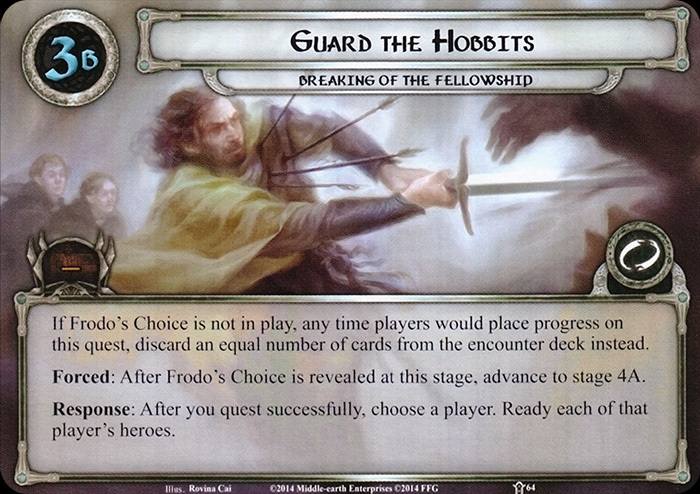 If Frodo's Choice is not in play, any time players would place progress on this quest, discard an equal number of cards from the encounter deck instead. 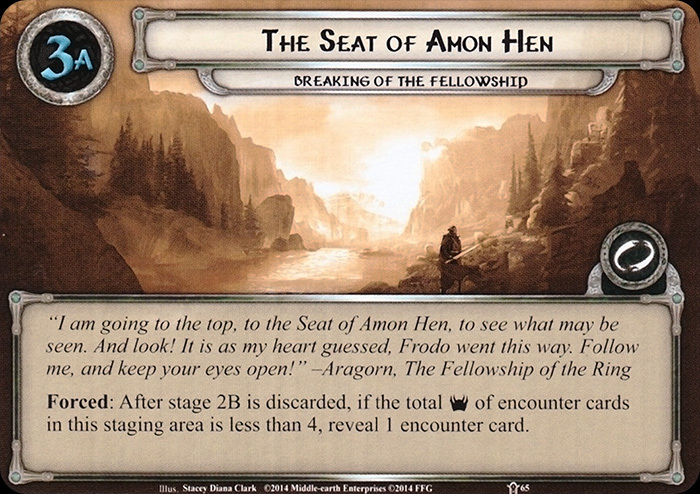 Forced: After Frodo's Choice is revealed at this stage, advance to stage 4A. Response: After you quest successfully, choose a player. That player draws 2 cards and lowers his threat by 2. 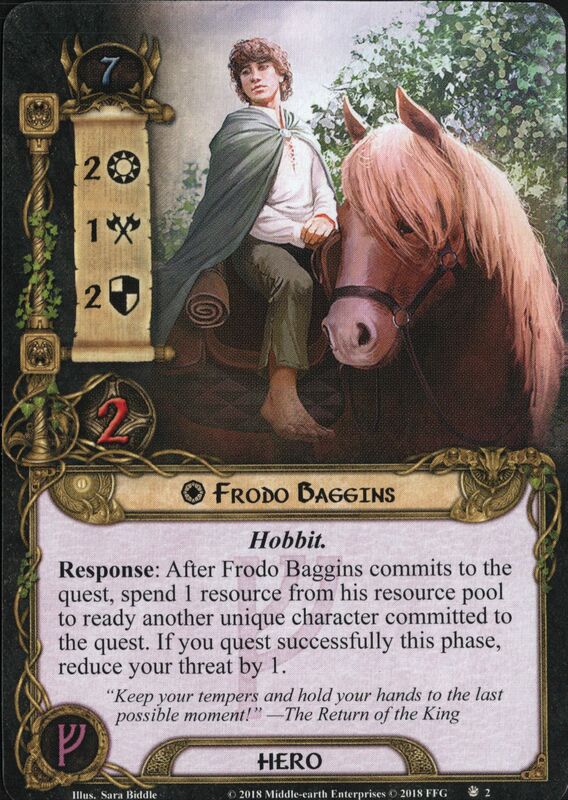 If Frodo's Choice is not in play, any time players would place progress on this quest, discard an equal number of cards from the encounter deck instead. 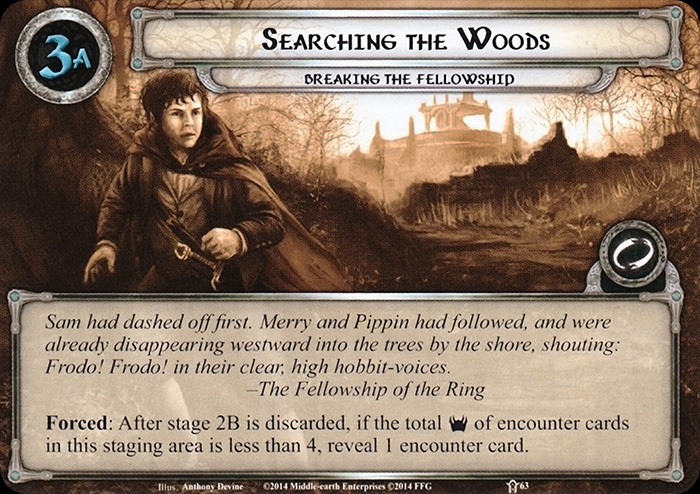 Forced: After Frodo's Choice is revealed at this stage, advance to stage 4A. Response: After you quest successfully, discard an enemy engaged with a player.